Accelerated Orthodontics | Douaa M. Girgis, D.M.D., P.C. In our continuing effort to provide you with the best dental care possible, we are proud to offer accelerated orthodontics solutions from Propel Orthodontics. These advanced orthodontic devices can help reduce the treatment period for your orthodontic treatment and they take just minutes out of your day. Propel Excellerator advanced orthodontic devices work with your existing braces or aligners to help speed up your orthodontic treatment. We can complete your Propel treatment in minutes during your regular orthodontic appointment. Clear aligners such as Invisalign are a convenient and comfortable way to straighten your teeth. Aligners work best when they are properly seated on your teeth and can apply the maximum amount of correction. VPro5 is an easy way for you to help seat your liners in the comfort of your own home. 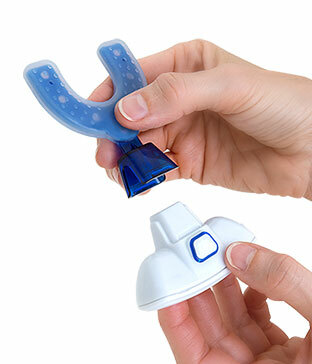 You use VPro5 for only 5 minutes each day during your orthodontic treatment. The VPro5 oscillator fits in your mouth over your aligners and gently vibrates to gradually move the aligners into the correct position.